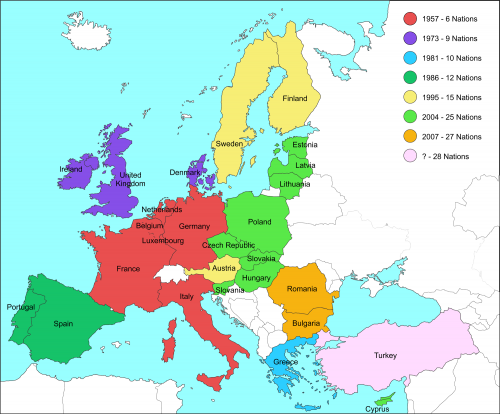 The most unexpected and significant expansion of the EC occurred in 1990 as a result of the crumbling of the Berlin Wall and the dissolution of communism across Eastern Europe. The resultant reuniting of East and West Germany into a new super-state promised to dramatically affect the course of world events. This expansion did two things. It created the most powerful nation within the EC and elevated the union to a point where at least potentially they could become the greatest political, economic, and military force the world has ever seen. With the addition of East Germany, the EC then had over 343 million people, compared with 240 million in the U.S at that time. The new growth in the European alliance could now become the seed to the creation of a new world order on a global scale. Terrance Petty of the Associated Press said that “even with the shocks and economic burdens of unification, the new Germany of 80 million people is an economic powerhouse astride central Europe.” He adds, “Now they have confidently taken the lead in European affairs, giving them the most dominant position they have had on the continent since Adolf Hitler’s defeat in 1945” (Associated Press, 10/6/91). Of course the new reunified Germany raised old fears among its neighbors, especially the British and the French. For the third time in the Twentieth Century, a united Germany has risen to clear European dominance. Even before the reunification, West Germany’s gross domestic product (GDP) represented about one-fourth of the EC’s total GDP. If Germany now decided to become a military superpower as well as an economic one, they could easily monopolize the entire European continent. The smaller nations of Europe had every right to be concerned.